The flat is really coming together! I moved into my flat in Edinburgh two months ago but it is now properly starting to feel like a home. We didn’t have a whole lot of furniture to begin with, and funds were low, so we had to buy things piece by piece with each coming pay check. I’m happy to report that I am no longer writing these blog posts from my bed or sofa but from my desk! The spare room/office is now nearly complete and I have the coolest desk built into the wardrobe. Pictures will follow on Instagram soon! It’s starting to feel a bit more like spring, despite the chill weather. If it rains in Scotland, you know spring is coming. I get warm fuzzy feelings when I see snowdrops growing in Princes Street Gardens. The are stupendously easy to make, and really quick too. Perfect for when you want something a little more special than just a piece of chocolate during after dinner, but not too fancy either. It’s the perfect pick-me-up — we certainly felt cheerful eating these truffles last night! The hazelnut butter I use in this recipe is manufactured by Meridian Foods. In my opinion (and this not sponsored at all) their nut butters are the best. They don’t use any palm oil in their products, which I personally appreciate. I buy it at Holland & Barrett in the UK but you can also find it online. US and other international readers, a quick Google search will tell you where you can purchase hazelnut butter in your own country — or just make you own at home. Note: this stuff does not taste 100% like Nutella. It probably could if I added a ton more sugar, cream, fat and whatnot… but then the list of ingredients would be much longer and the recipe wouldn’t be as quick or easy to make. This stuff tastes AMAZING. Pinky promise.You could use dairy-free milk chocolate for a slightly more authentic flavour, though. Place the first three ingredients in a small saucepan over medium heat. After a couple of minutes everything will start to melt together. Stir gently with a wooden spoon until evenly melted. Set aside to cool, then place in the fridge to set. After a couple of hours the chocolate should be solid enough that you can scoop up pieces with a teaspoon and roll 12 walnut-sized balls. Add the cocoa powder to a shallow bowl. 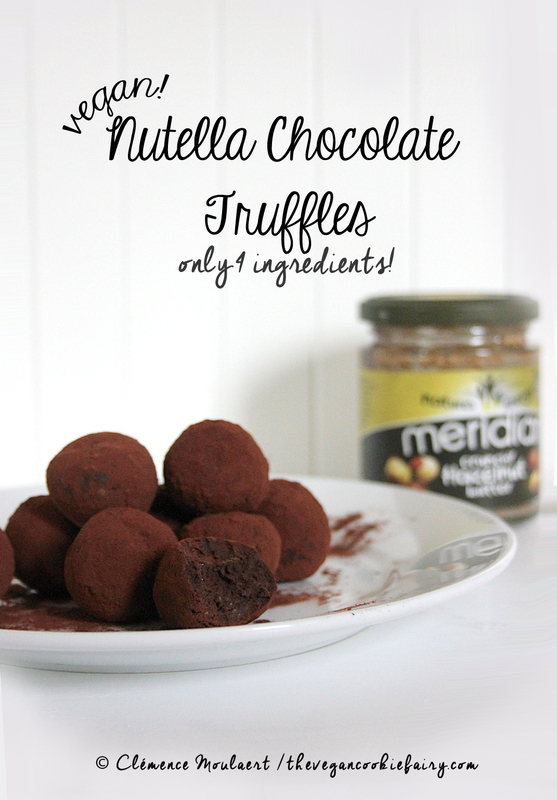 Roll each truffle in the cocoa powder to cover them entirely. Keep in an airtight box or in the fridge for up to 5 days (if you can resist them for that long!). OMG…..You did it again….La décadence …. Yummy….